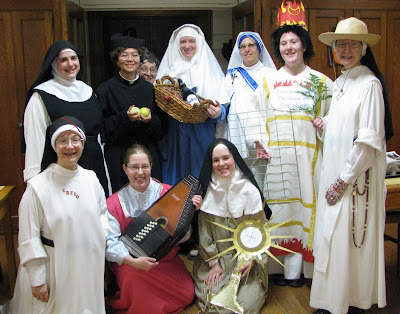 A few special saints and other holy people came by last night for a party in their honor! Below are a few pictures of our guests! Did you guess who they are? Front: St. Peter of Verona, St. Cecilia, St. Clare. Peeping from behind is Sr. Maria who put a grey wig on her head and said, "I'm my grandmother Maria of Menfi. If she could live with my grandfather than she WAS a SAINT!" Sr. Diana Marie as a young Mother Teresa! Sr. Janlyn as St. Cecilia. Sr. Joseph Maria as Don Bosco! Special thanks to Fr. Michael Barone for the Cassock and Biretta! Sr. Maria Teresa as St. Clare. Sr. Mary Catharine as Bl. Gabriella Sagheddo who offered life for Christian Unity. Sr. Denise Marie as St. Peter of Verona, first martyr of the Order. Sr. Judith Miryam as the Blue Nun! We stock holy water the way some people stock wine cellars and that Blue Nun bottle is great for Holy Water!